It´s time for Mexico! After 68 years, Mexico won its first Miss World title in Sanya, China, with Vanessa Ponce the Leon. After 68 years, Mexico has finally claimed its first Miss World title, with 26-year-old model Vanessa Ponce de Leon. She was crowned by the outstanding Miss World 2017 Manushi Chhillar of India in the end of Miss World´s 3-hour-long worldwide broadcast, held in Sanya China. Compared to its recent editions, Miss World 2018 was considerably more dynamic and colorful in 2018, bringing new and interesting elements into the competition. It started out with the introduction of the 118 candidates, having as background Sanya´s 5-star resorts. The candidates were divided according to the continents or regions they came from. Then came the always anticipated and culturally rich “dances of the world”, showcasing the dances and the music of several regions of the planet. For the first time, the candidates danced in duos or even in groups, which made it even more dynamic and fun to watch. Head-to-Head winners - Mauritius, Venezuela, Bangladesh, Chile, Malaysia, India, Singapore, Thailand, Mexico (who also qualified through BWP) and Uganda. Picked by the judges - China, Cook Islands, Belarus, Belgium, Northern Ireland, Russia, Scotland, Nigeria, South Africa, Panama, Barbados, Jamaica and Martinique. There were surprises among those who made it, and of course, among those who did not make the cut. For instance, countries like Brazil and Philippines, did not make the cut for the first time since 2010. Myanmar, Spain, Tanzania, Sierra Leone, Senegal, Trinidad and Tobago, Australia and Austria were also in the list of the ones expected to keep competing. However, it was a strong year, and most favorites kept on fighting for the crown. The Top 5: Belarus, Jamaica, Mexico, Uganda and Thailand. As for those who did not advanced, for the first time they could sit behind their countries´flags in something that looked like a Teleton counter, and watch the rest of the show. Perhaps in upcoming years they should take calls from fans and raise money for Beauty With a Purpose. Why not? We liked what came next: all 30 quarter-finalists walked the runway individually, followed by a video recorded in a Sanya beach, in which each candidate said something about herself. Although there were some technical problems with the sound during some of the first presentations, something that could, but should no happen in such a big event, it was fantastic to see all 30 quarter-finalists getting some time to be appreciated by the judges and by their countrymen at home. The announcement of the Top 12 was done continent by continent. Belarus, France and Scotland made it for Europe. Jamaica and Martinique advanced in the Caribbean. Mexico and Panama were the two from the Americas who kept alive in the competition. Then it was time for Mauritius and Uganda to take a step forward for Africa. And finally, from Asia & Oceania, the region with most quarter-finalists, Nepal, New Zealand and Thailand continued in the competition. Perhaps the biggest shock at this moment was seeing China being eliminated this early, considering that she did so well in some preliminary challenges. All 12 were interviewed, which was nice, but we missed an elegant evening gown parade, an important portion and one of the most expected ones in any beauty contest. From 12, 5 would move on to the final stage of competition. Miss World (Mexico) and the continental queens: Europe (Belarus), Caribbean (Jamaica), Asia (Thailand), Americas (Panama) and Africa (Uganda). New Zeland won in Oceania. From Europe, the judges picked Belarus, an airplane pilot that showed lots of personality and brains in the Head to Head challenge. If the fans around the globe were shocked that France was not a finalist, those who followed the contest from a close distance, including some of the candidates, were not. The information we get is that, as stunning as Miss France is (perhaps the most physically beautiful of them all), she did not make much of an effort to mingle with most other candidates, not coming across as friendly, a quality you would expect from a Miss World. Belarus started competing in Miss World in 2000, and this is the first time this European country placed there. Good for Belarus! From the Caribbean, it was Jamaica who was the chosen one, which was not surprising at all. Mexico qualifying for the Americas was also expected. She had always been a front runner and favorite for the crown. The same goes for Uganda, who was pretty much expected as the best from a strong African group. 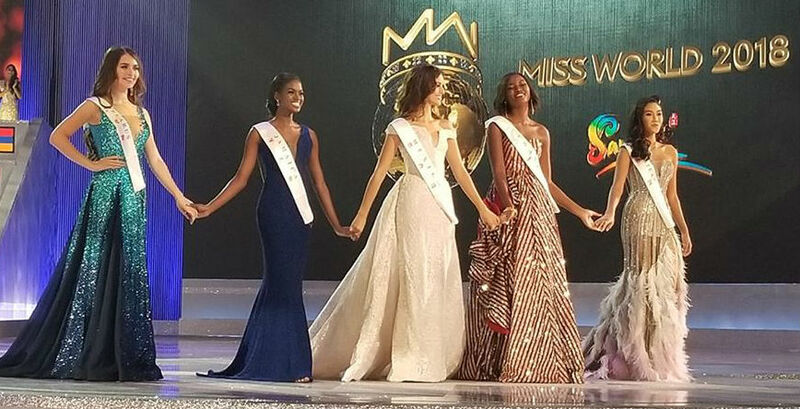 Like Belarus, Uganda had never placed in Miss World before 2018. Uganda debuted in Miss World in a distant 1967. From Asia, another surprise: Thailand! We shall forever wonder: why not Nepal? She won Miss World´s perhaps most valuable competitions, BWP and Multimedia, proving that she had it all to even become the next Miss World. Thailand is pretty and speaks perfect English, but we believe Nepal should´ve been the one here. With Nepal and France elimination, Mexico had a clear road to the MW crown! Unless a big surprise happened, which was not the case, it was clear that Vanessa Ponce de Leon, a young woman who has completed her degree in International Business and is currently on the Board of Directors of a Rehab centre for girls and volunteers for 'Migrantes en el Camino', would be Manushi´s successor. And so it happened: for the first time, the 2nd runner-up wasn´t announced. The 1st runner-up, said Julia Morley, was lovely (and surprising) Thailand, who conquered the best ever placement for her country in Miss World. And Miss World 2018 was Mexico! Manushi Chhillar crowns Vanessa Ponce de Leon, Miss World 2018. Beautiful and with expressive dark brown eyes, well spoken and very elegant, the new Miss World has a meaningful social project and looks like she is ready to take on her work as Miss World. The Sister Sledge presentation with its famous hit song “We are Family”, was vintage cool, perfect for the show´s final moments! The other musical attractions were not memorable, but not bad. We are Family, sang by the great Sister Sledge! Presenters Fernando Allende, Angela Chow, Megan Young, Stephanie Del Valle, Frankie Cena and Barney Walsh, did a good job. There seemed to be chemistry and a good connection among them and we liked the pageant presented in English, Chinese and Spanish, it gave it an international flavor. We congratulate MWO for making its show considerably more dynamic and entertaining this year! There will always be room for improvement, but what we saw this year was 100% better than last year, which is really fantastic! The winner is, once again, outstanding and absolutely deserved it! Way to go, Miss World!